On Friday 29th January, Anthony Charles Lynton Blair, QC., slithered in to the Chilcot Inquiry on the Iraq invasion in the Queen Elizabeth Conference Hall, opposite London’s Westminster Abbey. The manner of his arrival was entirely consistent with the less than transparent behaviour, which led to dodgy dossiers, an illegal invasion, a near-seven year (and counting) killing spree and those figures which which should be hewn, under his name, on a wall of shame in Parliament Square, throwing distance away: Approaching one and a half million dead, four million widows, five million orphans, four million displaced, in the name of liberation, freedom, democrocy, words defiled for all time. The man who knew: “I was right” and would have ‘”invaded even if I had known there were no weapons of mass destruction”, whose apparent lack of even a passing aqaintance with legality, humanity or straightforwardness, entered by a back entrance, apparently unable to look in the eye, Iraqis, bereaved of relatives and country, military families, bereaved by his manipulative certitudes and other protesters. This, the man who said, on being elected that: “I’m a pretty straighforward sort of guy.” While uncounted humanity continue to die as a result of his actions, this millionaire candidate for a new Nuremberg, cost the British taxpayer an estimated £250,000 for insuring his safety, during his six hour appearance. “The more he talked of his honour, the faster we counted the spoons”, comes to mind. 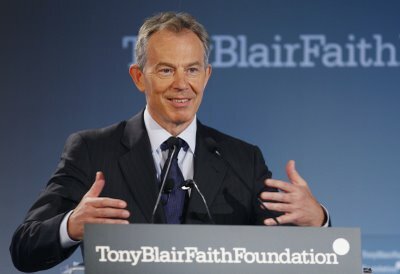 Blair is arguably a master of false witness and passionate intensity. He seemingly persuaded General Colin Powell, America’s military “Dove” (from My Lai’s massacre to Baghdad’s bombardments) to present, with passionate intensity, a load of garbage to the United Nations on 5th February 2003. It is with gratitude to the Movement to Abolish War, London’s Whitechapel Gallery and Curator Goshka Macuga, that Powell’s speech is revisited in a superb document: “The Nature of the Beast”, for the “Human Cost of War” exhibition, a reminder with the benefit of hindsight, of a calumny beyond enormity. Ms Macuga’s introduction to her incisive document, self explanatory, is here in part: “This exhibition revolves round the presentation of Picasso’s original painting, “Guernica”, at the Whitechapel Gallery in 1939 and the placement and role of the tapestry at the United Nations Headquarters in New York from 1985 to 2009.” This great, spine chilling work was covered, as Powell presented his: “U.S. Case against Iraq” at the United Nations, lest “We the people …” were reminded of the true horror of what he was proposing. Also in the Gallery was Ms Macuga’s chilling, dark, sinister,bulbous bronze bust of Colin Powell, encapsulating, in her words, a man who: “… assembled disparate elements to create a convincing argument … the consequences (are) thousands of deaths …. He has certainly come to represent the failure of moral responsibility attached to his position in government.” His presentation to the Security Council represented: ” … his performative skills and talent in in mediating false information.” Ouch. “Resolution 1441 was not dealing with an innocent party (but) gave Iraq one last chance to … comply and disarm.” No mention of a vital further Resolution to paper over these delusional flights of fancy,were Iraq to be attacked. “Saddam Hussein and his regime are concealing their efforts to produce more weapons of mass destruction.” Then follows a “transcript” of a conversation between an Iraqi General and Colonel discussing by telephone, concealment of weapons and related equipment. Were it not to lead to such tragedy, it would be utterly laughable, a script straight out Hollywood at its trashiest, littered with “yeah, yeah” and utterly un-arabic phrases such as “By God, I have one”, referring to another American obsession, a “modified vehicle”, which was to “be evacuated” along with “forbidden ammo.” Response: “OK, OK.” The construct is pure Amerispeak meets bad A-rab – on a Disney set. The idea anyway that any Iraq would talk about anything sensitive on a telephone, given the years of voice surveillance by both the US regime and their own, is hardly worth pointing out. Further: “… there are four hundred bombs” filled with biological agents “This is evidence, not conjecture. This is true. This is all well documented.” To back up this nonsence, UN dignitaries are treated to another Laurel and Hardy moment, an audio tape: “Remove. Remove.” “Nerve agents. Nerve Agents.” “I got it.” “Nerve agents. Stop talking about it. They are listening to us. Don’t given any evidence that we have these horrible agents.” Good thing a living didn’t depend on the script. No producer on the planet would have done anything but dump it in the bin. It now transpires that a document headed “confidential,UK/US eyes”(1) was finalised on 11th June 2001, approving a “secret plan to foster an internal coup” against Saddam Hussein, giving the lie of enormity to Blair’s and Powell’s assertion regarding 9/11 – in which even the US or UK have ever, anyway claimed there was an Iraqi or an Afghan on board. Who ever was responsible for the attack on the Twin Towers, it was anyway a tragic, criminal act, not a reason for invasions and occupations. What a metaphor for the United States, Britain – and the manipulation of the United Nations by Blair and his shoddy acolytes appearing before Chilcot and for the former Secretary of State, General Colin Luther Powell, at the UN, on 5th February 2003, ringing the death toll for Iraq. The crocodile and the Macuga bust of Powell would make perfect bedfellows. And “Iraq” will be engraved on both their grave stones – if anyone bothers to erect them.